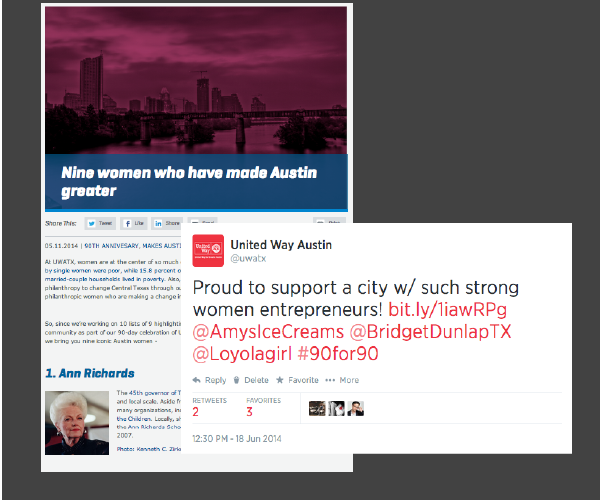 When we set out to celebrate 90 years of United Way (UWATX) making Austin greater, we received a lot of suggestions from staff to create lists of 90 – 90 volunteers, 90 philanthropists, 90 people who are 90-years-old, etc. Clearly, there was some organizational synergy around the list concept, but 90 lists of anything seemed daunting, so we set out to reconcile the need for lists with the need for quality content. 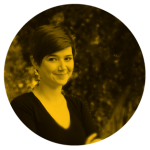 Address organization’s desire for lists of 90 while still creating high-quality content. 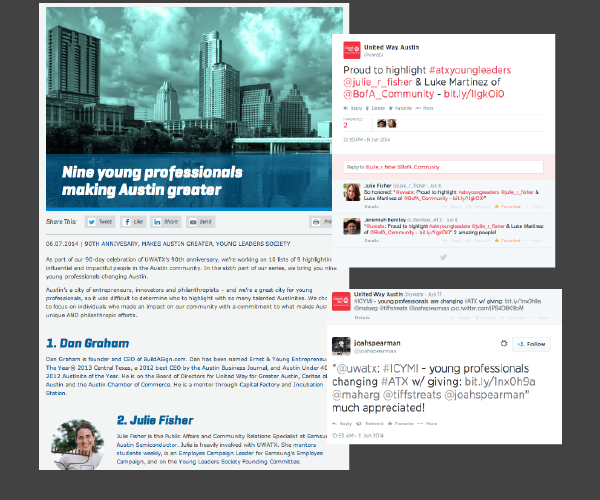 Re-imagine list as a series – 10 lists of 9 – and focus on topics reflective of Austin (Tech, Volunteering, Music, etc.). 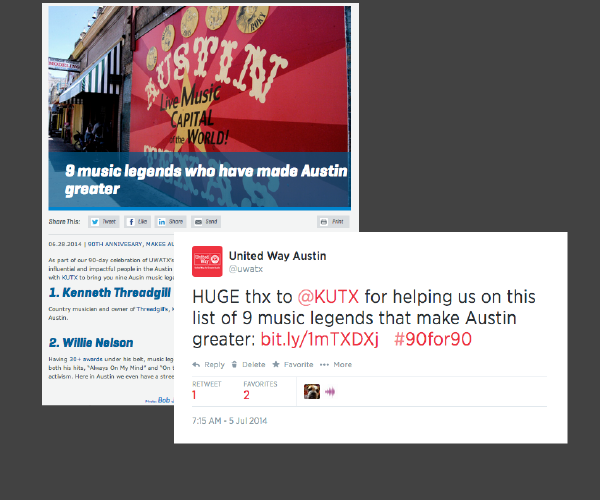 Lists are trendy – and also useful: Popularized by Buzzfeed, the ‘listicle’ format was particularly trendy during the timeframe of this campaign. This format necessarily makes content immediately scanable – users can look over a longer piece of content and digest it easily and quickly, which is ideal for digital storytelling. Listicles also have the added benefit of de-facto including numbers in the headline, something that’s been shown to draw users attention. Staff suggestions reflected a love for lists as well, so we knew there was something in the air around the idea of lists and wanted to explore how to make this format work for our story. People share flattering news about themselves & their friends: As we had already learned with our social recognition campaign #ThankYouThursday, individual recognition is a strong driver for social sharing – people like to share positive feedback with their communities. Connecting to individuals with diverse (or sometimes no relationship) to the organization could open up new audiences for our content. 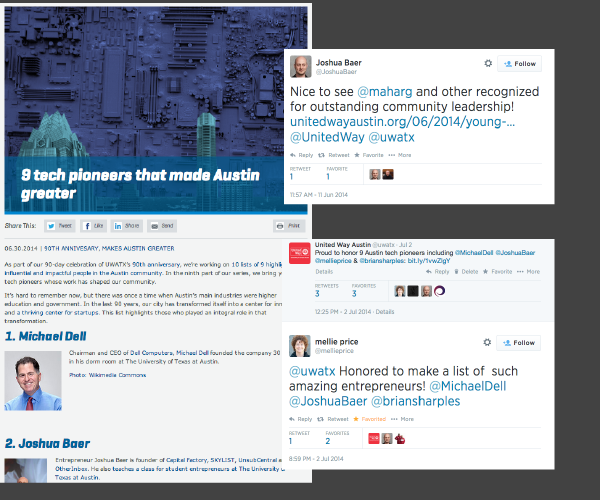 Our connection to Austin is UWATX’s biggest selling point: UWATX’s work often focuses on systems-building work, which makes the type of emotional appeals that other nonprofits employ a challenge for the organization. 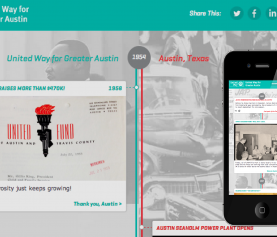 On the other hand, because the work looks at the future of our community from a long-term perspective, UWATX has a connection to Austin, the future of the city and the growth of the community that is unique within the nonprofit space. 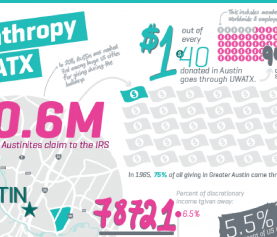 At the same time, Austinites love their city, so this unique connection is a valuable selling and message point that differentiates UWATX from other organizations and that resonates with our broader audience. 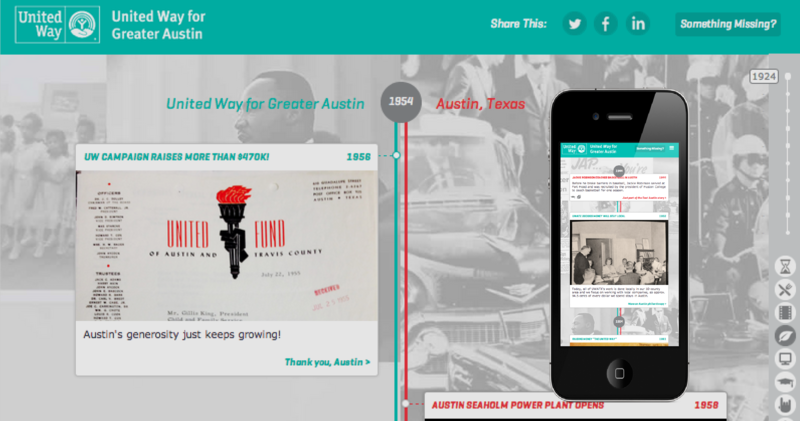 By tapping into niche Austin communities and interests, we could reinforce this connection. Tagging people slows down the Twitter lifecycle: The lifecycle of an individual tweet is notoriously short, because Twitter functions like a real-time newsfeed. For an organization with a smaller Twitter following (meaning a smallish number of folks could see each post) and a small social media staff (meaning challenges in creating more content), slowing down this lifecycle is hugely beneficial. When you tag an organization or individual, your post moves from their stream into the notification tab, where you have fewer other posts to compete and a greater likelihood of being retweeted or favorited. By getting into the notification tab, you can give a tweet a longer life. Of the 63 blogs we’ve posted this year, two of the 10 lists of 9 blog make it on the TOP 5 list of most-viewed post to date this year. 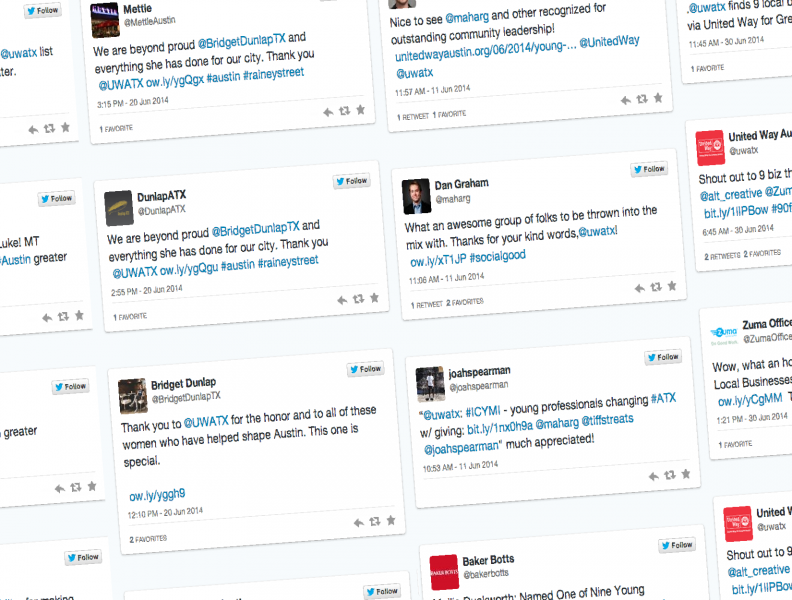 We saw particularly outstanding success with the young professionals blog – which drew 450+ visits from Twitter alone in two days. 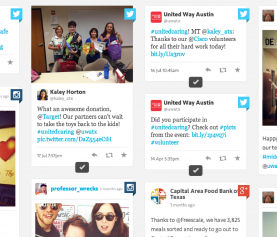 Many of the associated tweets are compiled in this Storify. The type of audience and personal connection that one can draw on Facebook is significantly different from Twitter. On Facebook, we saw great response from existing followers who recognized themselves or a friend in a post, but did not see a bump when those featured were not already followers of UWATX on Facebook. 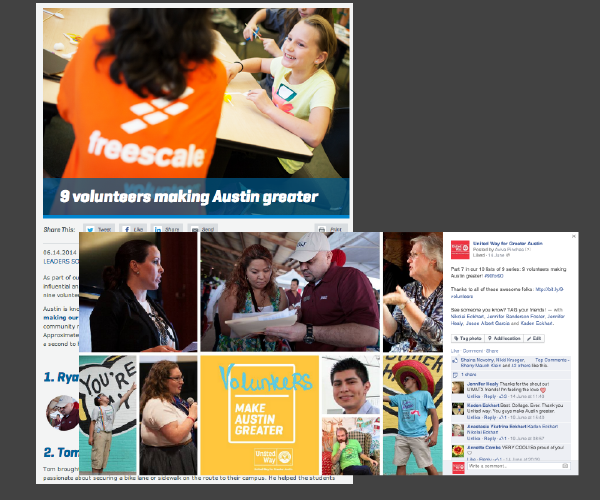 As a result, the most successful of the ten posts on Facebook as the volunteers post, which featured largely existing followers who were socially engaged. The opposite was true on Twitter – while our existing followers did share posts mentioning them, the far greater response was from users we did not previously engage with. This shows that Twitter works well as a platform for new engagements while the nature of Facebook ( positive feedback loop built into the algorithm, restrictions on brands connecting to individuals) means that it is more relevant for existing audiences.